Green Tea Spa is a licensed home-based spa in Saskatoon providing natural and organic body care in a private, chemical-free environment. Owner Danae Montpetit chooses products with the highest standards to use for her manicures, pedicures, waxing, brow and lash tinting and facials. Its prodcuts are especially great for pregnant moms, people who like to make eco-friendly choices and those who may suffer from allergies. Click here for more information about its spa products. 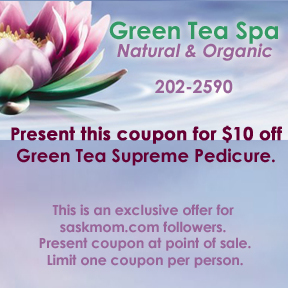 Green Tea Spa is offering a special discount for saskmom.com followers. Click the coupon to the right, print and bring in for $10 off a Green Tea Supreme Pedicure. This coupon is valid for one use only. Book your spa appointment today at 202-2590, via e-mail, or through the Green Tea Spa online booking service.